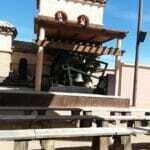 If you’ve never been out to the Arizona Renaissance Festival, there are so many exciting and fun activities to do. I’ve been going for many years and have enjoyed many wonderful acts of comedy, music, dance, and skill. This year, my husband and I headed out to the festival with a focus to see the shows rather than go shopping. While I will mention some of the great places at the Faire, I will be concentrating more on how many fun shows you can see for the small price of $26. As you enter the festival, you might get overwhelmed. There are a lot of people waiting to get inside the gates but one of the first items you pick up is a map and schedule of events. Don’t lose it, it is your best friend and will help you find all the best shows and when they are. 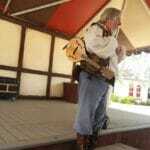 One of the best acts to catch and will absolutely wake you up is the 10:30 Tartanic show on the Falconer’s Heath. 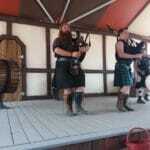 These men without pants aka in kilts have been playing at the festival since 2005 and their act doesn’t get old. 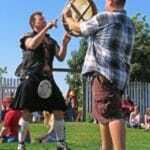 They play the bagpipes and drums, combining the sound into a fun-filled sound that I can never get enough of. Each show is a little bit different. My husband loves them so much he sees them at least three times when we visit the festival. Next up is the heavenly sounds of Cast in Bronze. The performer, Frank, has combined an instrument not normally seen, the carillon with other music to create such a unique sound that the first time I heard it, I stopped dead in my tracks and sat down to hear his show. Ever since I’ve never missed a chance to hear him. His music is some of the most beautiful at the show. If you go, make sure you see this act at least once. 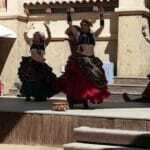 I watched Ghazaal Beledi World Music & Dance next. They have their own musicians, these lovely ladies and are as excellent to listen to as the ladies are to watch. The music is traditional as is the belly dancing. The ladies do several types of dances, a bowl dance as well as a scarf dance, each one more challenging than the last and each dance is grace in motion. The energy is powerful and I can watch them over and over. After watching the dancing, we had a chance to stop and grab lunch. There are places all over the festival to eat with many different types of food but at least once you should try the famous turkey leg or steak on a stake. Also recommended is to make you drink plenty of water as it’s easy to get dehydrated during a sunny day outside in Arizona. After lunch, I headed to Hey Nunnie Nunnie. This comedy act is family friendly and full of Catholic humor. 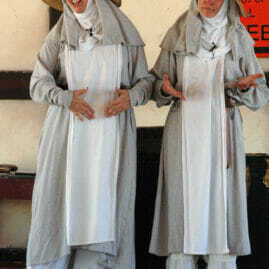 This pair of nuns, Mother Superior and sister Philomena will leave you in stitches as they make puns about fish and loaves, sing silly songs about bowel movements, and use a variety of objects in comedic ways, like a sports finger as a mustache. The nuns will leave you laughing the entire time and even children will sing along with their songs. After Hey, Nunnie Nun, Zilch the Torysteller takes the stage, with his particular brand of comedy spoonerisms. The afternoon show is Jomeo and Ruliet, the classic Shakespearean tale as told by Zilch. It is difficult to describe his particular style but it begins with geeky and ends with a lesson in theater and reversed language. One of the first tips, don’t try this with the word Fuddruckers and fighting buccaneers. Part of the charm is how well Zilch uses spoonerisms but also how many comedic moments there are as he tells the story of the star crossed lovers with jokes interspersed throughout. Thankfully, most children won’t catch the jokes, mostly because they have to translate it and even having heard the story many times over the years, I still laugh at all the jokes. 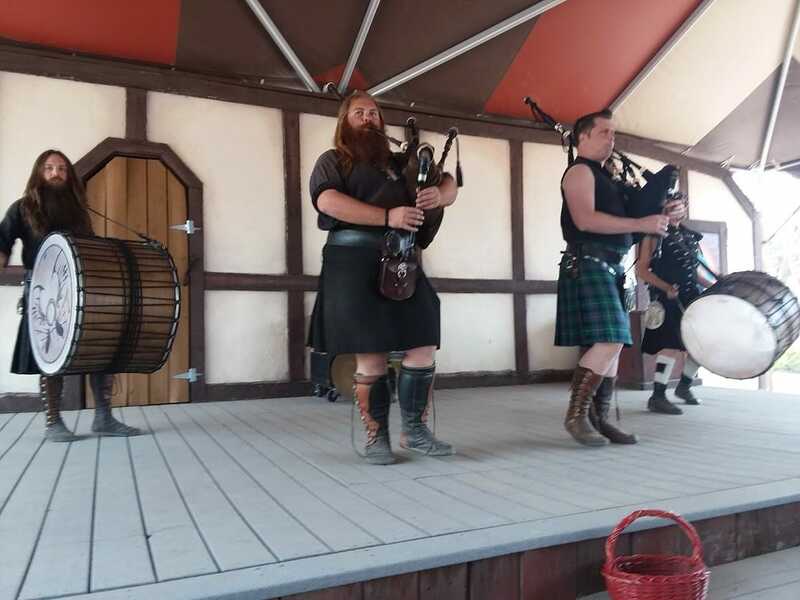 Of course, we had to have a second helping of Tartanic in their ever rowdy, ever fun performance. One of the wonderful things that the guys from the band do is encourage other players or dancers. At this particular set, a young girl, seven or eight, got up and did her own step dance on tempo with the song Tartanic was playing. Even though they were supposed to finish the song earlier, they continued to allow the young girl to finish her dance. It was exuberant, sweet and the entire audience loved it. While we loved all the shows that we saw that day, there are so many we missed and that others may enjoy. 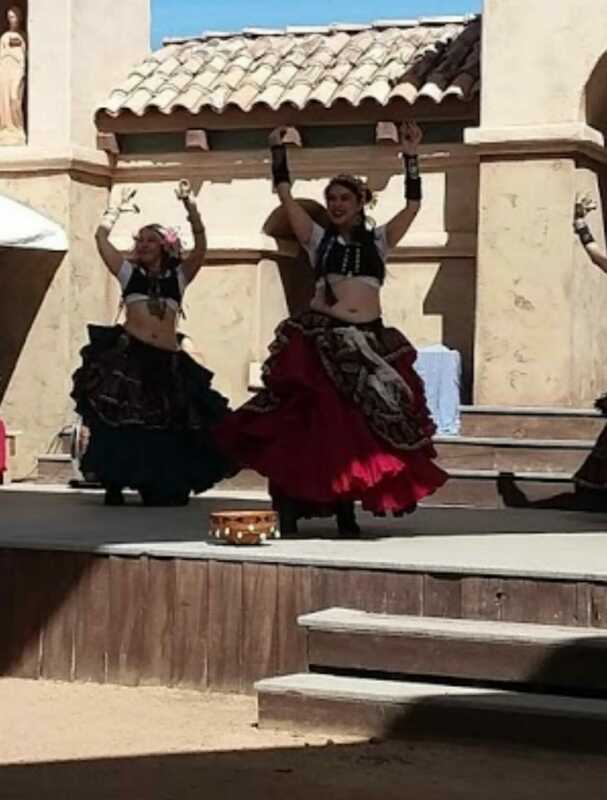 Some of the key acts that perform at the Arizona Renaissance Festival are the famous Ded Bob show that everybody needs to see at least once. Fifi is not to be missed. Another famous and hilarious act is The Tortuga Twins, Scaramouche, D’Angelo, and Raphael. Most of their skits are a bit r rated but parents are always warned and the Twins always try to keep the jokes so they aren’t easily understood by a child. Even more, despite their rowdy jokes, all three men are complete sweethearts off stage and always welcoming to their fans. 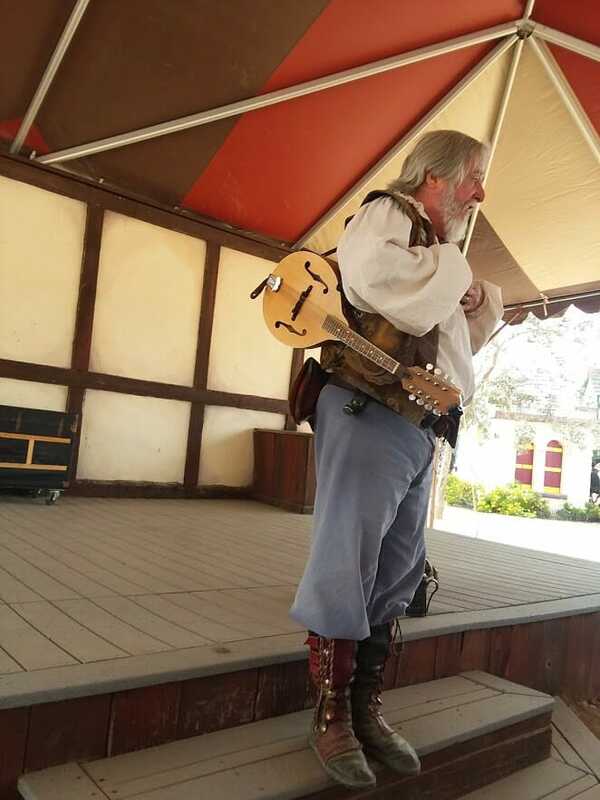 There are many other acts at the Faire that are worth checking out but these are just a few of the ones we’ve enjoyed over the years. If you don’t enjoy shows, there are artisans of all kinds at the Festival and shopping for any type of item you might enjoy. You can buy medieval clothing, leather boots, or armor. There are hats, like at New Pterodactyl Leather. There is perfume and lotions, candles and jewelry. You can get your hair braided or your child can take one of the rides like the Dragon. There are even knights and jousts, literally something for everyone. 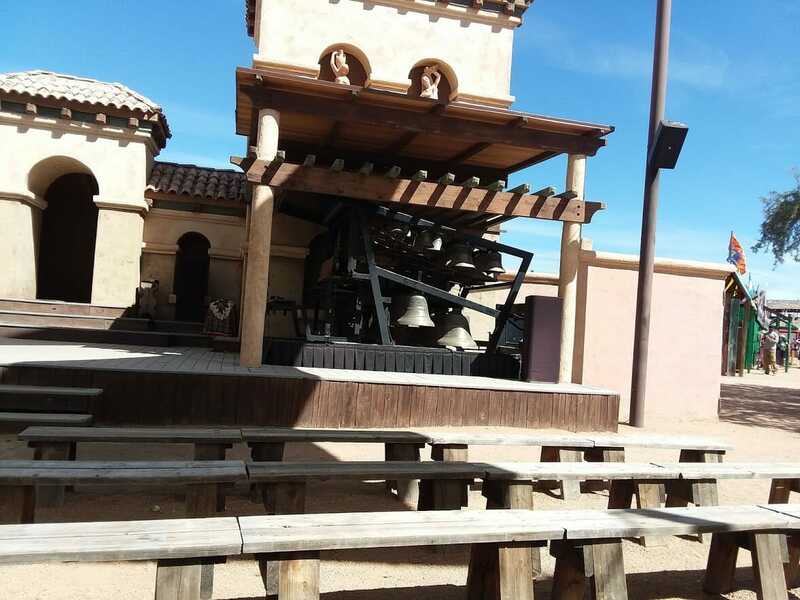 If you haven’t made it out the Arizona Renaissance Festival this year, you can always go next year. 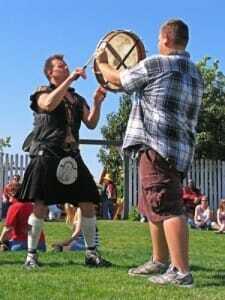 They have been entertaining families for over thirty years and play throughout the months of February and March, eight weekends in total. There are special weekend events every year and students days that teachers can arrange a time for their classes. There are classes at the Croft area and glass blowing demonstrations for those of all ages. It is truly an event for the entire family.